When you walk into Melissa Essig’s third-grade classroom at the Crested Butte Community School, your curiosity is awakened immediately. The room spurs the imagination, so you want to explore all the colorful posters, signs, cubbyholes and intriguing objects that sit on the shelves and line the walls. Plants lend an outdoor, refreshing feel of greenery to the room and each plant is named for the child who gave it to Ms. Essig. Ms. Pac-man is chomping a wall, while a well-loved, life-sized Grover from Sesame Street sits above a cabinet. He was Melissa’s fuzzy stuffed pal when she was a youngster herself. Desks are set up facing each other in an open square formation so all the students can see each other. This is the first year the students get their very own desk, because prior to third grade they had community tables. Each assigned desk has the child’s name neatly printed on a long, colorful paper scroll taped to the top edge, along with a chart of the cursive alphabet and other useful tidbits. Melissa explains that third graders will be taught to write in cursive, a script that is being dropped in many schools across the nation but, as she points out, it’s extremely useful in so many aspects, from reading the original U.S. Constitution to simple hand-eye coordination, and some children, Melissa says, find cursive far more fun and even easier to write because of its flow. Melissa spent weeks readying for Monday’s first day of school and her enthusiasm for her incoming students is obvious. She is one of the many reasons our community school has been ranked in the top 12 in the entire state. Her commitment and genuine joy in teaching can make you want to go back to third grade yourself. On the insistence of her childhood girlfriend, Julie Reid, Melissa headed west to visit Crested Butte, where Julie was living. She had only been west of Illinois once, when she flew to California, and feeling that she had run her course in Michigan, Melissa took a summer road trip in 2000 to discover a new home. But Melissa admits that she was skeptical of the renowned winters here, since she hated winter. “You don’t see the sun during Michigan winters and the snow is just something to complain about,” she says justifiably. After their three-week tour, Melissa returned to Michigan with a game plan to move out to Crested Butte, but just for the summer, which she anxiously awaited through another harsh Michigan winter. Although Marchitelli’s was her family, Stepping Stones Preschool was the catalyst to get Melissa to go back to school. “I realized that I wanted to teach, so I enrolled at Western State College in 2002, graduating in 2006 with a bachelor of arts degree in interdisciplinary studies education. I was absolutely planning on staying here. By my first full year here, I knew this was my home.” Ironically, Melissa confesses her decision to stay was because of the winter she had once dreaded. And what’s even crazier is that her other childhood Michigan friend, Billy Laird, married her best friend Julie—all three had grown up together. It’s been said that to get a teaching job in the Gunnison Valley, you have to wait for someone to retire or die. But what actually happened was that there was a drastic change in the population from 2001 to 2009, and the latter was the year Melissa was hired. “We had a great time,” she says of the interview. “We laughed and I felt completely at home and comfortable, and they hired me.” It certainly seemed like her destiny was to teach at the CBCS. With growth in the family population Melissa points out, “They needed more teachers in a way that they hadn’t in a long time.” Crested Butte had already outgrown the new school and had started building the addition. 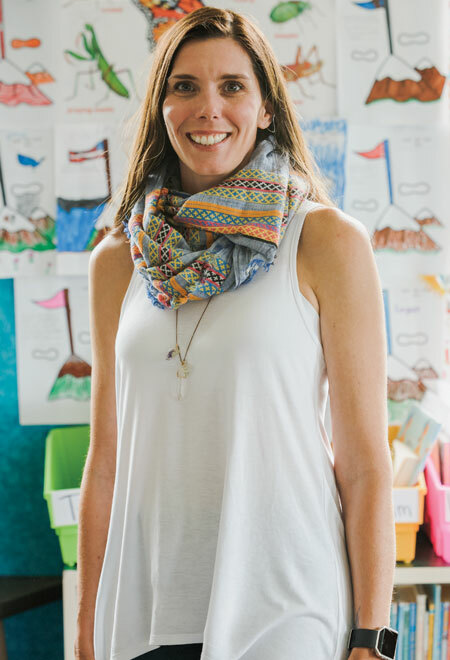 This school year, she’s come full circle and has returned to teaching third graders. She pulls out a sheet of “Melissa Moola” and just sparkles in anticipation of giving the Monopoly-like dollar bills printed with her smiling face in the center to her new class. She explains that by signing up and completing classroom chores from the “job board” tacked on the wall, kids can earn their Moola, for doing jobs like Recycle Wrangler, Desk Fairy, Cubby Patrol, Pencil Sharpener (yes, they still use pencils, since they’ll be learning to write cursive). With the earned Moola, kids can “buy” cool supplies and perks, from markers and crayons to other surprises. Outside of school, Melissa explains why you don’t necessarily know or meet everyone in this somewhat small shire called Crested Butte. “I have a theory that you know who you know in this town based on when you go to the coffee cart.” Based on this philosophy, she had never run into Tim Essig, despite the fact that he was living in Crested Butte. “I met him in Larkspur at a Widespread Panic concert,” she tells. They met August 19, 2001 and they married five years later to the day, complete with a double-rainbow wedding, even though it wasn’t raining. Melissa is still thrilled about calling Crested Butte home and she still marvels about her first sight of Crested Butte, driving down that hill into town, how she felt that connection that many who settle here feel. “Sometimes when I drive back down into town I revisit that memory,” and, she smiles, it’s always heartwarming.